Designing with color in Glen Burnie is the perfect way to end the summer. One of the most powerful forces in the landscaping world is color. Each color has its own effect, it’s own power. Combining colors can create new and exciting possibilities for your next landscaping project, so we’re going to give you some awesome design tips that are going to turn your yard into a wonderland. Are you ready to get designing with color in Glen Burnie? Well, let’s get started! 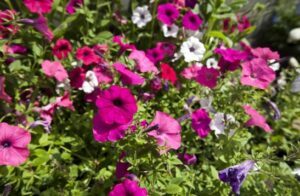 Before you even choose the plants you want to incorporate into your new landscaping project, you should consider two things. You should consider that most, if not all, of the plants you are going to use are going to have green in them. You should also consider which color scheme you are going to use. There are several color schemes to choose from. There’s monochrome, or only using green for your landscaping project. There’s analogous, which combines two colors that are beside one another on the color wheel. There’s complementary, which combines two colors that are across from each other on the color wheel. Finally, there is riotous, which is a combination of vibrant and bold colors. It is very difficult to get right, but can bring a certain level of whimsy and excitement if done properly. When you go to choose the colors you’re going to incorporate into your new landscaping project, you should think about the ways that color can affect mood. This will change the experience of sitting in your garden or relaxing in the back yard. The color green is probably going to create the foundation of your landscape. The color green brings harmony, peace, and vitality to your yard, making a great place to start. Combine it with white to create a very serene landscape. Blue and green can also combine to maximize on the calming effect of your landscape. So, which colors will you choose for your Glen Burnie landscape? Need professional landscapers to help you achieve your dreams in Glen Burnie? This entry was posted on Sunday, August 9th, 2015	at 7:21 pm	and is filed under Blog, Landscaping Design	. You can follow any responses to this entry through the RSS 2.0	feed. Both comments and pings are currently closed.